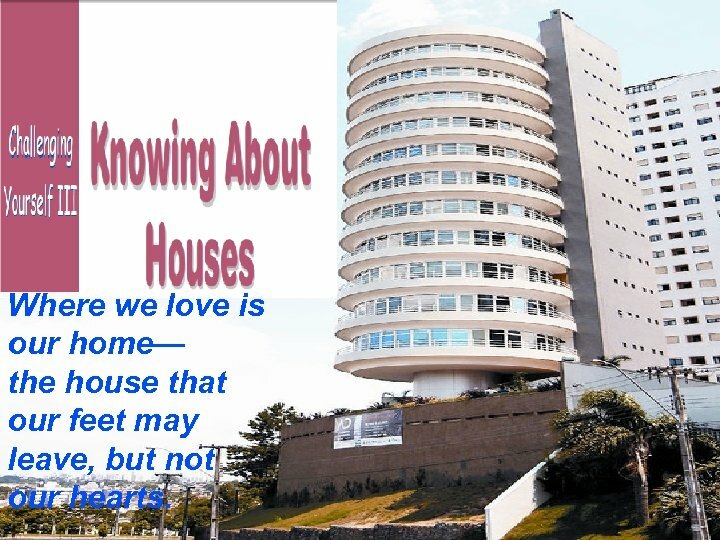 Where we love is our home— the house that our feet may leave, but not our hearts. Which of them would you prefer to live in ? Why? 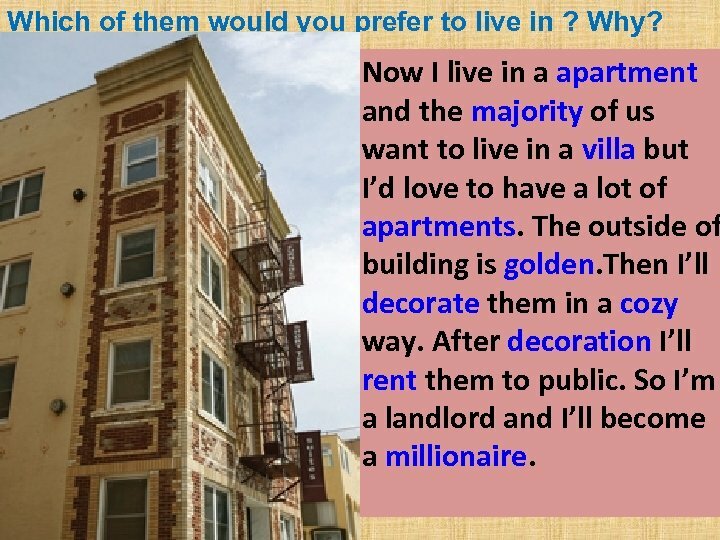 Now I live in a apartment and the majority of us want to live in a villa but I’d love to have a lot of apartments. The outside of building is golden. Then I’ll decorate them in a cozy way. After decoration I’ll rent them to public. So I’m a landlord and I’ll become a millionaire. Do you know what kind of houses most British live in? What kind of houses do most Americans live in? 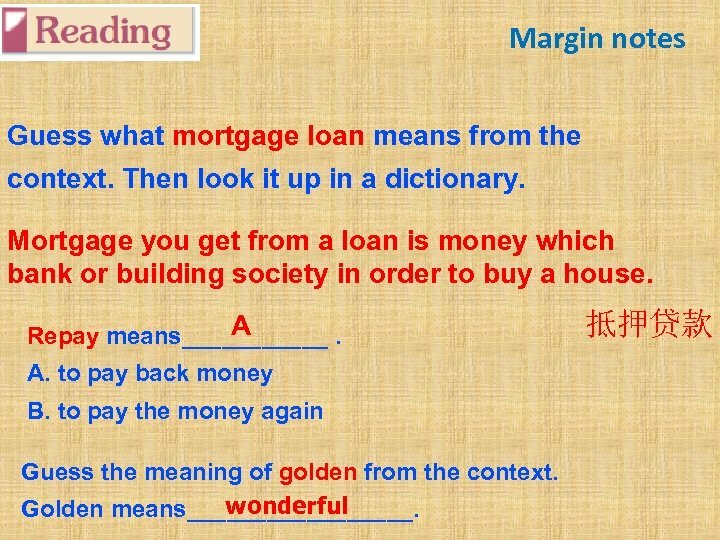 Then read the text quickly to check your guess and complete the Margin notes. 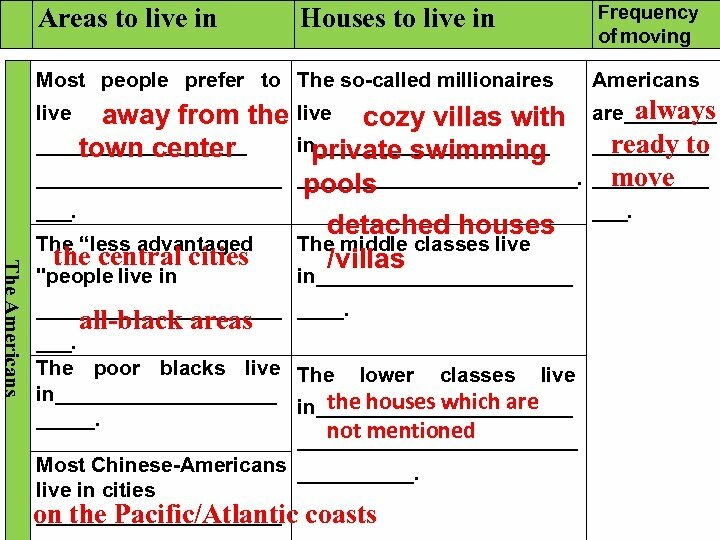 Frequency Areas to live in Houses to live in Read the text carefully and complete the form. moving of Over 80% of people Every 2/3 people live The suburbs live in _____. The British The low-paid workers live in_____ the inner cities ________. 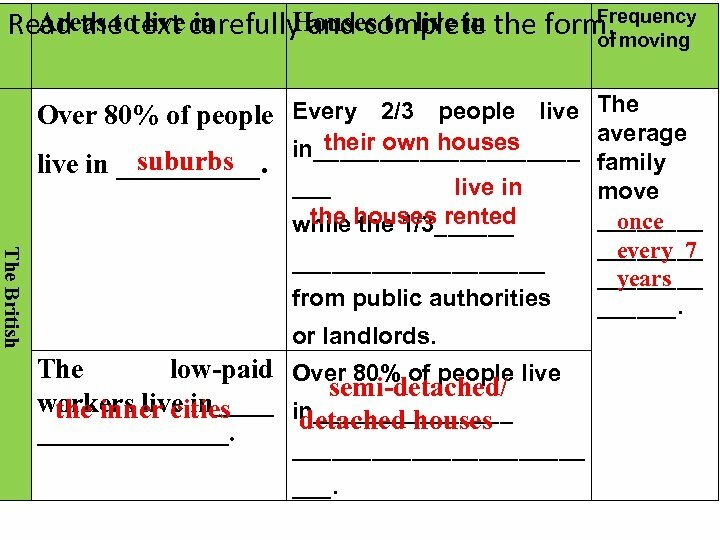 average their own houses in__________ family ___ live in move the 1/3______ once while houses rented ____ every 7 __________ years from public authorities ______. or landlords. 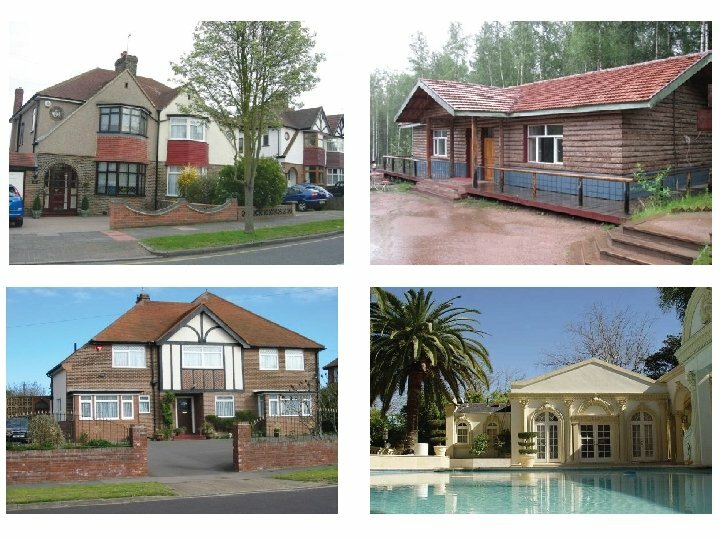 Over 80% of people live semi-detached/ in________ detached houses ___________ ___. Divide the whole class into three groups and answer the questions. The group who tell us the right answer will get one point. 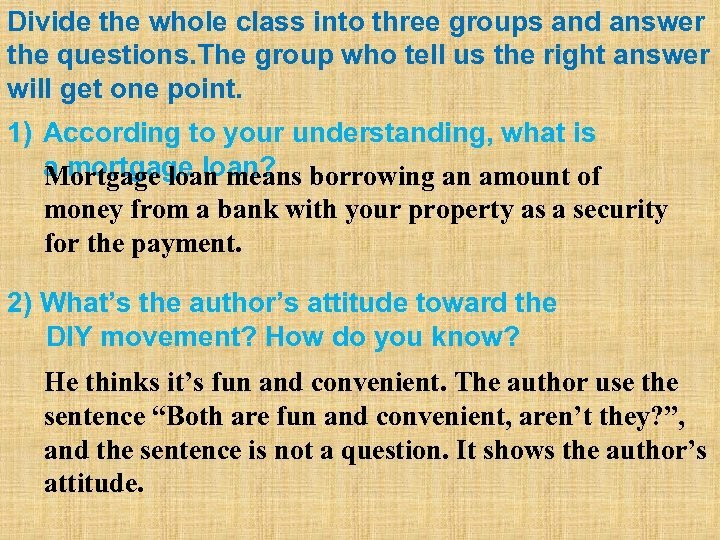 1) According to your understanding, what is a mortgage loan? Mortgage loan means borrowing an amount of money from a bank with your property as a security for the payment. 2) What’s the author’s attitude toward the DIY movement? How do you know? He thinks it’s fun and convenient. The author use the sentence “Both are fun and convenient, aren’t they? ”, and the sentence is not a question. It shows the author’s attitude. 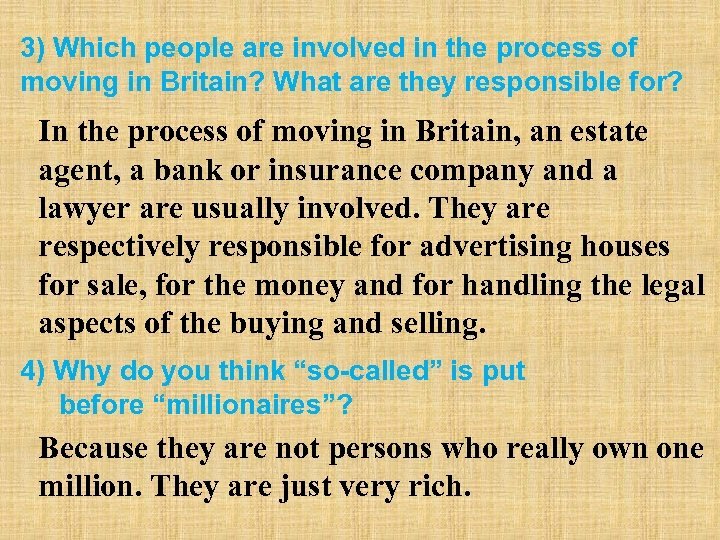 3) Which people are involved in the process of moving in Britain? What are they responsible for? In the process of moving in Britain, an estate agent, a bank or insurance company and a lawyer are usually involved. They are respectively responsible for advertising houses for sale, for the money and for handling the legal aspects of the buying and selling. 4) Why do you think “so-called” is put before “millionaires”? Because they are not persons who really own one million. They are just very rich. 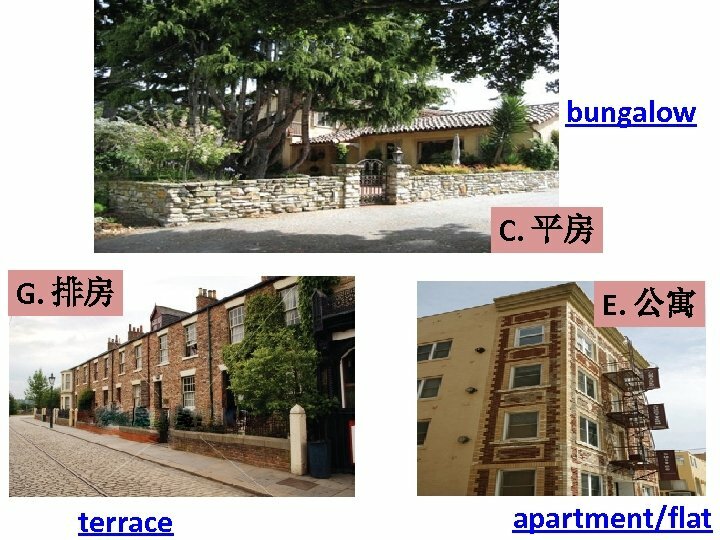 5) Where do the lower-class people live? According to the text, we may infer that the lower-class people may live in the city. 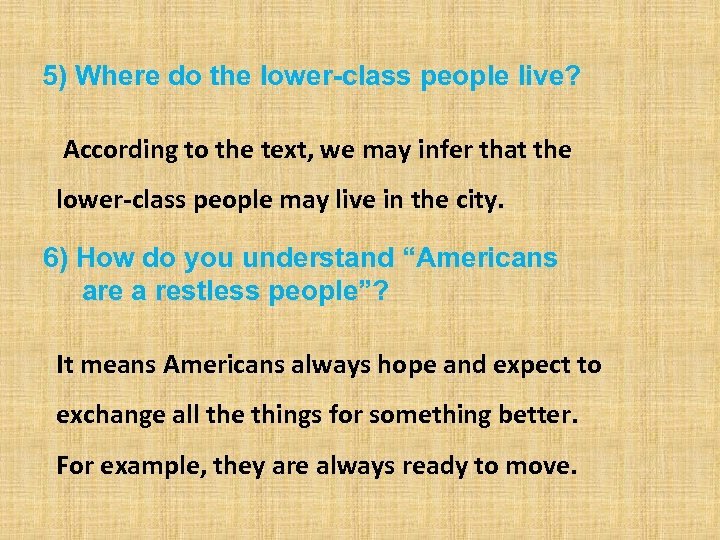 6) How do you understand “Americans are a restless people”? It means Americans always hope and expect to exchange all the things for something better. For example, they are always ready to move. 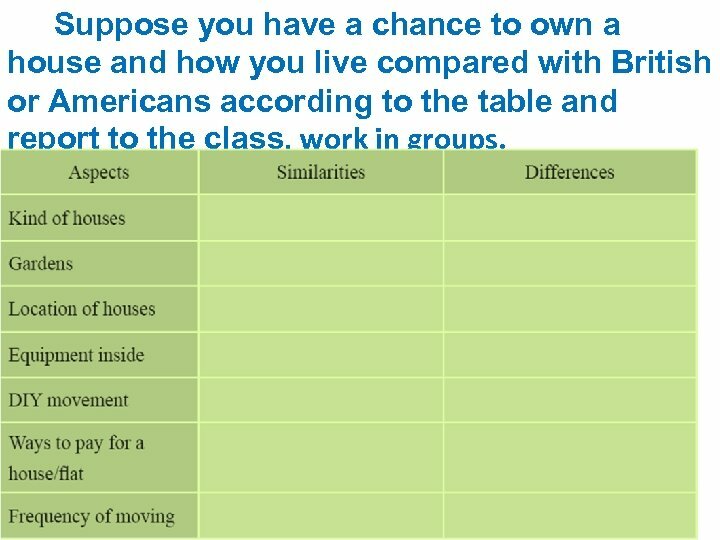 Discuss with your partner to summarize the similarities and differences in the way British and American live according to the table above. 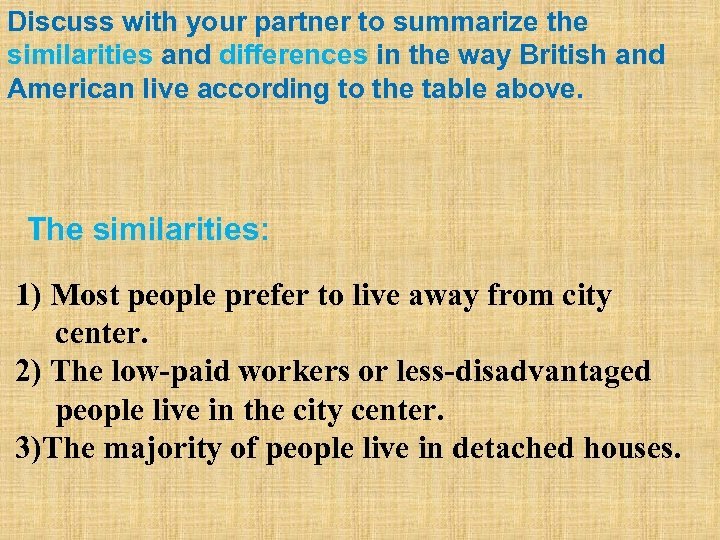 The similarities: 1) Most people prefer to live away from city center. 2) The low-paid workers or less-disadvantaged people live in the city center. 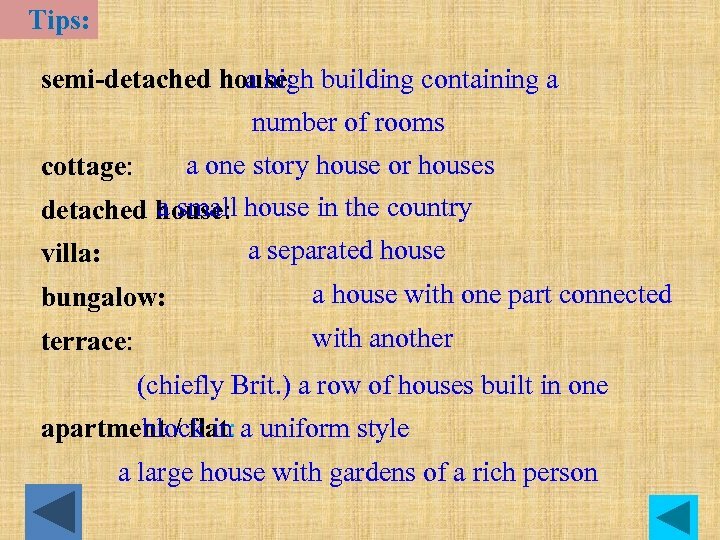 3)The majority of people live in detached houses. 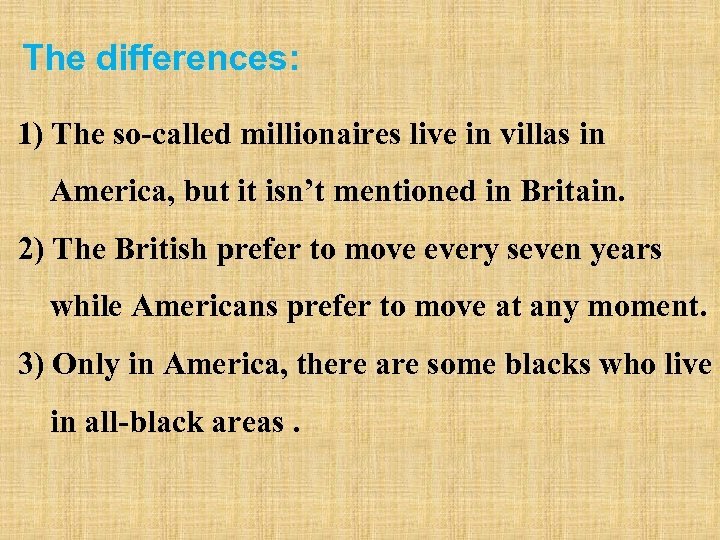 The differences: 1) The so-called millionaires live in villas in America, but it isn’t mentioned in Britain. 2) The British prefer to move every seven years while Americans prefer to move at any moment. 3) Only in America, there are some blacks who live in all-black areas. 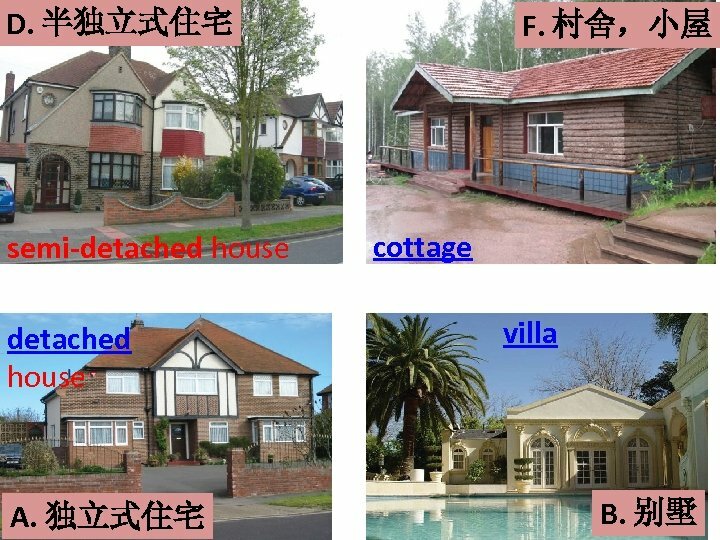 Suppose you have a chance to own a house and how you live compared with British or Americans according to the table and report to the class. work in groups. Language Points 1. 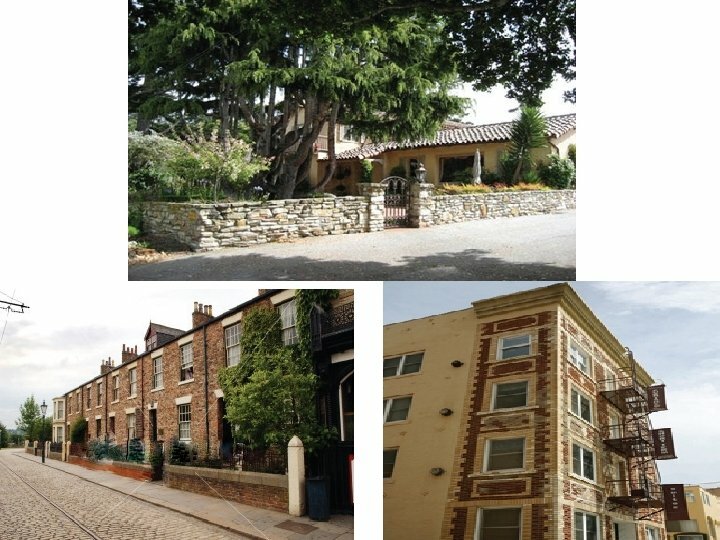 In Britain, approximately every two out of three people own the houses they live in. 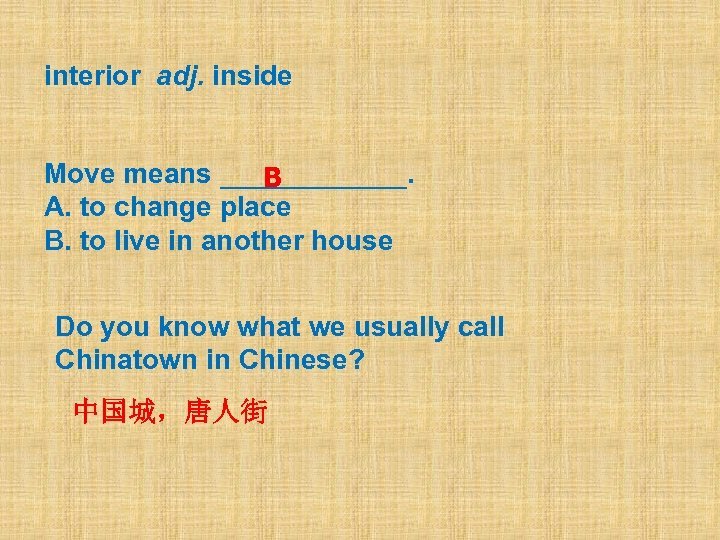 every 在文中表示“每（逢、隔）” 1）every other +单数名词 We have computer lessons every other day. 2) every +基数词+复数名词 A new car will come along the line every ten minutes. 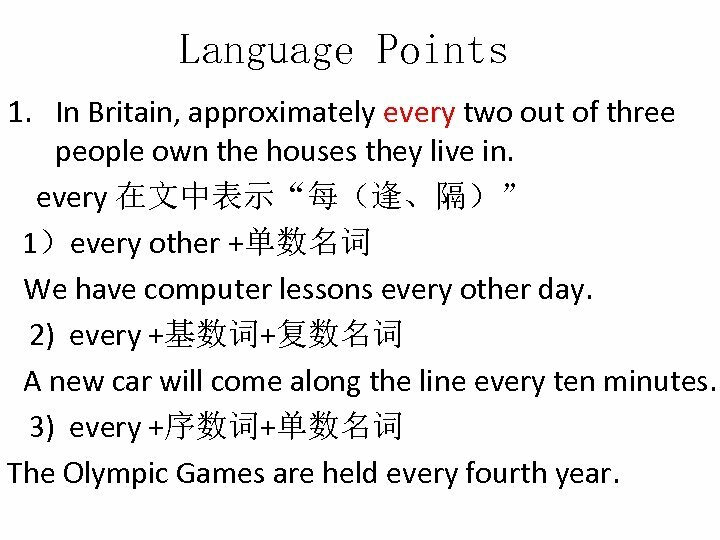 3) every +序数词+单数名词 The Olympic Games are held every fourth year. 2. But buying a house is a large investment for many people and the majority buy their homes with a mortgage loan from a bank. 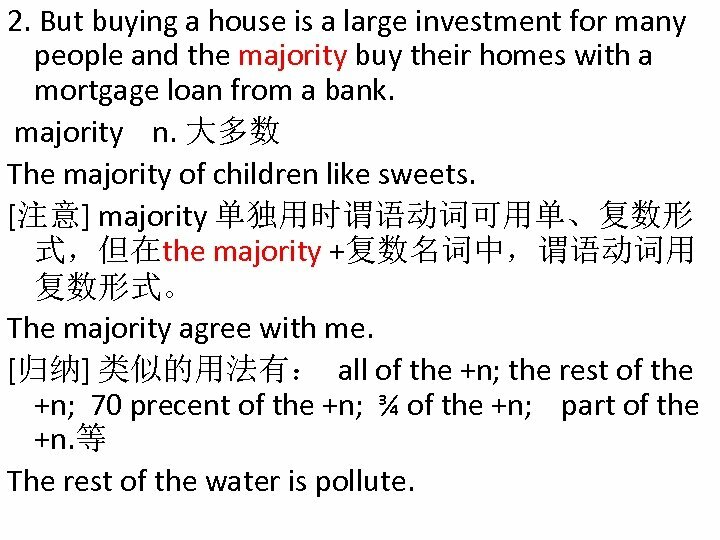 majority n. 大多数 The majority of children like sweets. [注意] majority 单独用时谓语动词可用单、复数形 式，但在the majority +复数名词中，谓语动词用 复数形式。 The majority agree with me. [归纳] 类似的用法有： all of the +n; the rest of the +n; 70 precent of the +n; ¾ of the +n; part of the +n. 等 The rest of the water is pollute. 3. How about the remaining one third? 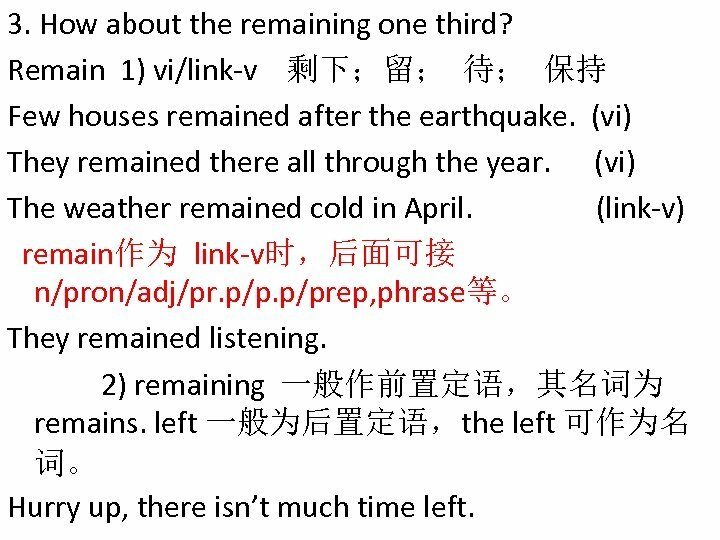 Remain 1) vi/link-v 剩下；留； 待； 保持 Few houses remained after the earthquake. (vi) They remained there all through the year. (vi) The weather remained cold in April. (link-v) remain作为 link-v时，后面可接 n/pron/adj/pr. p/prep, phrase等。 They remained listening. 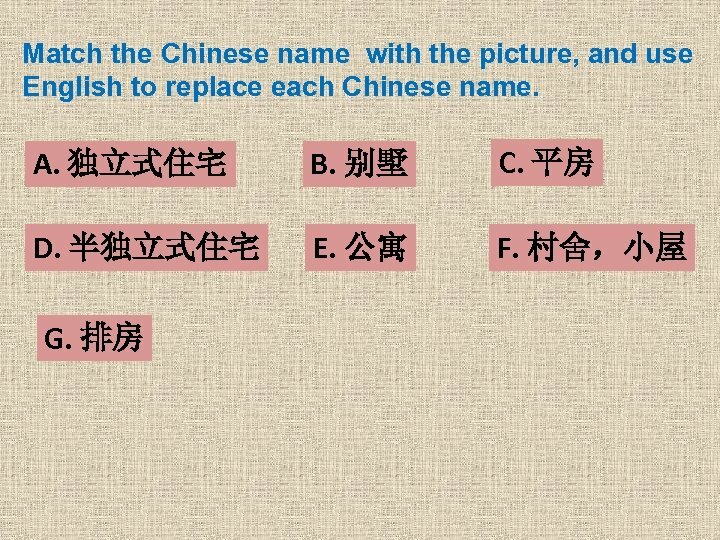 2) remaining 一般作前置定语，其名词为 remains. left 一般为后置定语，the left 可作为名 词。 Hurry up, there isn’t much time left.